Today has been a day of mixed emotions. If you were to ask me my state earlier today (after the early morning bus) I would have responded in the affirmative as I sat outside the busy dive shop in Tofo waiting for the boat to return and take my group and I out on a whale shark encounter. If you were to ask me right now I would respond in the negative. It is 1:30 am in the morning and I am trying to sleep on an old couch infested with rats, that I can hear moving inside of the couch frame while Andrew is sleeping next to a sticky little four year old African boy. Let me explain the change of events. We arrived this morning at 7:00am in inhambane, after catching another 3:00am buses. Mozambique does not do “night” buses instead they do early, early morning buses. Every time we have gone to catch a bus it had been at 3 or 4 in the morning. I actually do not mind taking these buses because it gets you into your destination very early in the morning so that you can still have the day to explore the city. When we arrived in inhambane we took a ferry across the channel to the main city, which was absolutely beautiful. The waterside was lined by old Portuguese cathedrals, homes, shops, and a huge clock tower. Although most of these buildings have not been up kept since the Portuguese colonial ended, they still have a beauty about them. We walked around inhambane for a while and actually ended up running into our friends from Northern Spain that we met at Baobab Backpackers in Vilanculos. They were eating breakfast at a little cafe, so we decided to join them while they drank their coffees and ate their pastries. Andrew and I have discovered that most of the backpackers we have met during our travels have either been from South Africa, Spain, or Italy. I tend to just assume that all Europeans have this love for backpacking the world, but I have come to find out that most the Europeans I meet backpacking are actually from Spain or Italy. The Spanish and Italians just seem to have a sense for adventure I guess! After we dined with the Spanish coup leader, we decided to hop on a chapa for Tofo where we were scheduled for a dive with the whale sharks. Tofo is world known for being one of the best places to swim with the largest fish in the sea, the whale shark. In the Tofo waters there are constant sightings of whale sharks, manta rays, humpback whales, dolphins, and devil Rays. As you know, I love animal encounters so I was more than excited to be able to dive with the most magnificent creatures in the sea. 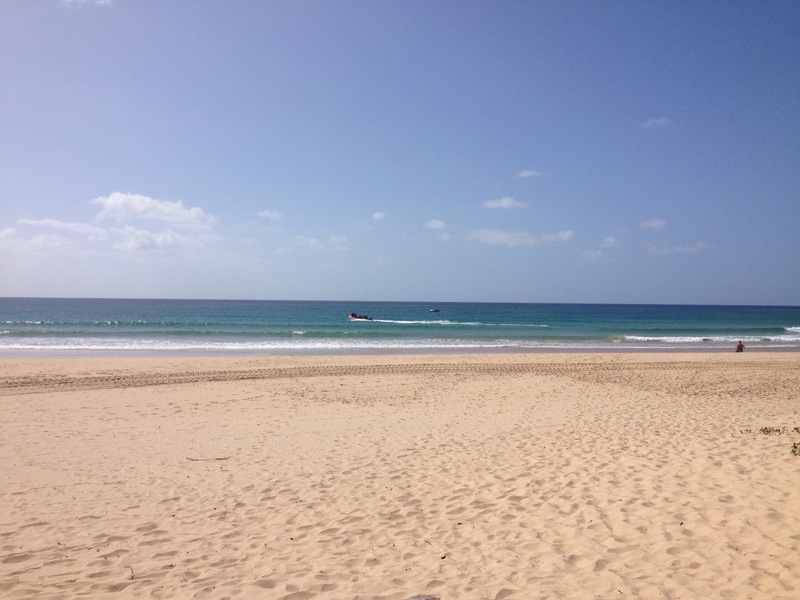 We arrived in Tofo so early that we had the entire morning to explore the beach and local markets before setting off on our whale shark adventure. We were out at sea from 1-3 and saw dozens on humpbacks, a pod of dolphins, and one whale shark. The whole boat ride was an adventure, and the entire time I felt like I was a Somali pirate looking for a cargo ship to take down. We were in a boat with two people from France, four from the Netherlands, and one from South Africa. The water was very rough, and several people got sick on our boat, which made for an even more interesting experience. We have gopro footage that captured it all, and I can’t wait to share it with all of you. Although I did not get to swim right alongside a giant whale shark, like all the videos show, Andrew and I had an incredible time and we will definitely be back to Tofo soon to go whale shark diving again. After our excursion ended we returned back to shore by Beijing the boat in the sand, which was also quite the adventure. We spent ye next hour or so trying to arrange our accommodations for the evening and transport to Maputo the following day. Today was a whirlwind of emotions because we discovered that the train we wanted to take from Johannesburg to Cape Town filled up the moment we decided to buy ur connecting flights from Cape Town to Johannesburg on the 19th of August and on top of that our contact in inhambane for the night bailed on us. So much of our planing had gone right out the window at that moment, so I decided just to let it go for the afternoon and make alternate plans after our whale shark excursion. Now that our whale shark excursion was over it was time to make those alternate plans. Andrew was able to contact someone in Inhambane who was also traveling to Maputo in the morning and I was able to sort out the train and flight issue. We departed Tofo right as it became dark, and arrived in our little chapa about an hour later in inhambane. Filipe came to get us from the central market and take us to his little home. What we did not realize is that Felipe was actually packing up all his stuff to move to Maputo the next day. His little house was filthy and completely filled with random things. We took the bus that we were going to take in the morning to his house to confirm with the driver that everything would fit in the bus trailer. In Africa there is no such thing as a u-haul, the local bus is the best you can do for house moving. There was no way Andrew and I were both going to sleep on a tiny bed with a little African boy moving around in his sleep. I laid on the coach in my clothing from the day and without any food or water for the past several hours. There was no bathroom, electricity, or running water in the home. I finally fell asleep around 8:00pm and woke up again at 10:00 needing a toilet. I ended up squatting in front of the home trying not to let the neighbors see me as I went to the bathroom. By this point I was delirious, having no sleep from the several nights before, feeling completely dirty, and trying to get comfortable on a little couch. I fell back asleep at 10:30 but woke up again at 11:00pm to the sound of a rat family moving in the cushions of the couch. That was enough for me. I sat on the otherside of the couch for the next three hours huddled in my blanket trying to keep the Mosquitos off of me. I was just grateful that I had airtime on my phone to access the Internet and keep myself distracted until it was time to start helping Filipe pack up his house. I could talk about a lot more, but at this point I am sitting on the bus to Maputo absolutely exhausted and ready for a clean bath and soft pillow. I honestly cannot wait for that day. It has been very humbling for me to stay in some of the same conditions of the people here in Africa. They will never even dream of a clean bath and soft pillow because they don’t even know they exist in the world. My eyes have been opened to a whole new world of living and honestly I don’t think I would be strong enough to live it. The people here are incredible, strong, and determined to live a happy life despite their circumstances. I admire that and which I were as strong. All I can think about right now is all the things that I miss from home and I am SO GRATEFUL that I get to return to all those things so soon. With our last morning in Vilankulos I was more than a little happy that I would finally be free from a herd of Mosquitos! The couch Kylie and I were using as a makeshift bed always seemed to have 10-20 of the little guys flying about. We rose at 2am and got our things organized for the journey. Since we’d gotten conflicting counsel from locals and foreigners we decided to bite the bullet and get a lift to the bus station. We thought it best to avoid any trouble this late in our journey. The cab ride was an expensive 150 mets… Or 3+ dollars. We got to the bus station without incident and boarded it with our two Spanish friends. We all slept for most of the ride, only waking at odd bumps or jolts along the road, and after a couple hours we arrived in Maxixe, the tow neighboring Tofo. We quickly disembarked, I withdrew money, and we boarded a local ferry to cross. We were, as is usual for Africa, crammed in like sardines to the small vessel. We crossed without anything crazy happening and were greeted by the beautiful city of Inhambane. 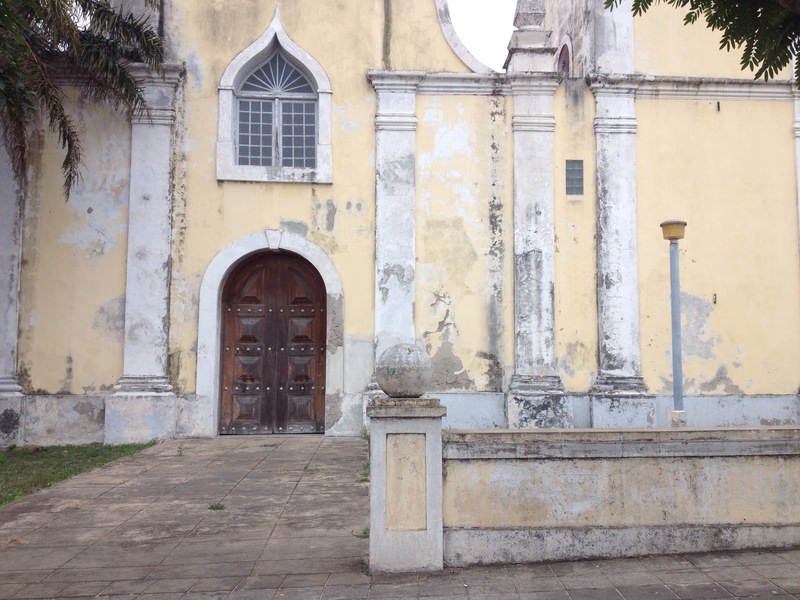 Inhambane is an old Portuguese town, and the architecture certainly holds to its old roots. The buildings are beautifully constructed, albeit rundown, and the colors of red/orange tile on the roofs is quite a sight. It doesn’t seem at all to be like Africa. We got to the main market area of Inhambane and grabbed a small bus to get to Tofo, home of the whale shark diving! Tofo scuba, a group we organized to go with is famous for holding ‘water safaris’ where you go out in a boat to hunt for whale sharks and other great sea life. They loaded us with all the gear that we needed and we were off into the water. The wind and waves were quite frigid and Kylie and I shivered the entire journey. Unfortunately we didn’t have any whale shark encounters, but we did see humpback whales and dolphins (which we attempted to swim with). Along the boat ride one of the guys in the back got sick so I’m sure not seeing whale sharks wasn’t a big loss for him. We took a long chobi ride back to Inhambane as the sun was setting and met with Felipe, the member we were to stay with. When we arrived at Felipe’s place, I was a little concerned. The floor was dirty and cracked, the place was messy, and the entire place looked in disarray. Turns out Felipe lives in quite humble conditions and he’s moving tomorrow morning. I buckled in for a rough night of sleep (shared bed with Felipe’s son) while Kylie who couldn’t bring herself to sleep somewhere so dirty, crashed on the much cleaner couch. Sometimes our experiences in Africa are wonderful and fun, and other times they are fierce reminders of the situation that many people live their daily lives in. Another early bus tomorrow to Maputo.